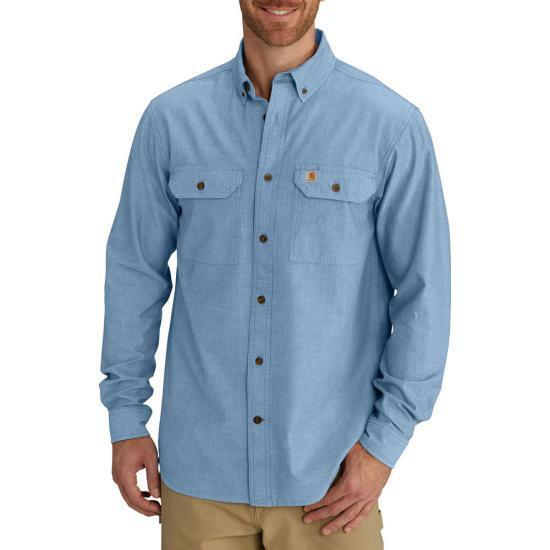 Perfect no matter what the weather is like outside, this lightweight 4.5 ounce cotton shirt will surely become one of your favorites. Featuring two chest pockets with flaps, this shirt also features a center box pleat on the back for ease of movement. Every aspect of this shirt is superior. From the quality of the material to the craftsmanship. The fit is great with the full swing arms. The attention to detail is obvious with the button down breast pockets and the well placed collar buttons. Very comfortable on those cooler days. I like the color and fit of this shirt. Because it's chambray, it will wrinkle a bit unless you get it out of the dryer immediately. Way oversize for me. Probably perfect for a corn fed boy.Workmanship is good. Can't tell the wear since I'd only wear it with a down vest underneath.Best work/but still everyday casual enough pants that last: Carhartt.Real material if you like Canvas Cotton (Tho sizes are getting dicey).I like the substance and weight of canvas britches - parachute pants, not so much.Recently, I see flashes in films of their stuff being worn by Mercs and Mil/Spec-op. It's not advertising fluff, it's reality. Their products hold up.Order shirt a size small, however. I like it to bad not made in U.S.A.
Looks and feels comfortable just too small for me. The 4x I ordered was too small. I need to return them. Can you help?Great looking shirt, just need to go up to a 5XLTARE THESE AVAILABLE?